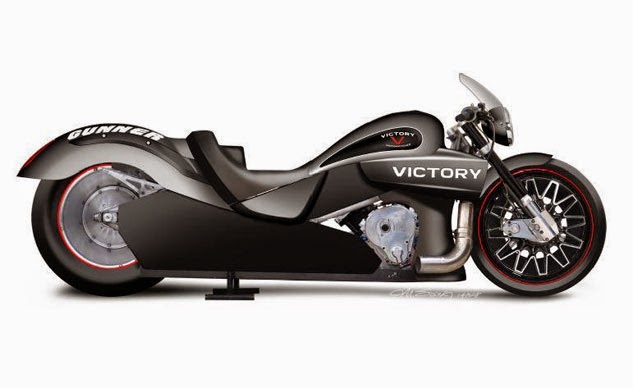 Victory Motorcycles has announced plans to compete in NHRA Pro Stock motorcycle drag racing, marking a major step for the Polaris brand that some had begun to think was being left to wither on the vine. The Victory factory team will begin competing this March and be headed up by the husband and wife team of Matt and Angie Smith. Matt Smith is a two-time world champion, finishing the 2014 season ranked 4th in overall standings. Angie Smith finished last season ranked ninth overall. The two will be riding drag bikes based on the Victory Gunner, which will rocket them to speeds nearing 200 mph. However, the actual engine used will be an S&S, similar to the bike they used when racing a Buell in past seasons. "Victory is excited to enter the world of NHRA Pro Stock Drag Racing." said Steve Menneto, VP Motorcycles for Polaris. "It is Victory's intent to continue to test ourselves at the highest levels and the Victory Factory Racing Team is the perfect opportunity for us." Minnesota-based Polaris is the parent company for both Victory and Indian motorcycles. Indian's recent successes, coupled with a disappointing 2015 line up from Victory had led many to question Polaris' commitment to Victory. This move suggests faith in the brand remains strong. Although these Victory drag bikes will contain S&S engines, recent performance-focused projects suggest that Victory will be eager to race one of its own engines in the not-too-distant future. The National Hot Rod Association claims to be the largest motorsports sanctioning body in the world, with more than 40,000 drivers on its roster. The NHRA Pro Stock season opens on March 13th at the Gatornationals in Gainesville, Fla.